Ask anyone what they think was the most significant work published by Ted Hughes at the end of his life and the answer will probably be Birthday Letters, poems detailing his response to the suicide of his wife Sylvia Plath but held back until just before his death in 1998. But ask me and I’d say his Tales From Ovid published in 1997. The blurb on the back of my copy, which I’ve recently been re-reading, claims that “it is as if Latin and English poet were somehow the same person”. My Latin isn’t good enough to fully judge the accuracy of that judgement of the quality of the translations, as literal translations, but they certainly present Ovid’s stories in a fluent, pithy and highly readable form. They work perfectly as verse, as narratives and as versions of these tales from the Ancient World recycled by Ovid in the Rome of Augustus and recycled since by, among others, Chaucer and Shakespeare. Given the importance of Ovid to Shakespeare and the importance of Shakespeare to Hughes (see his Shakespeare and the Goddess of Complete Being) it is appropriate that he should have tackled this final task and given us his own versions at the end of his life. Swayed and waited to fall. Either way, she saw only death. Denied, had to be death. No weapon was to hand – only water. Out of his forehead burst a rack of antlers. Through his heart like blood. Diamonds from the interiors of stars. Bringing heaven down to listen. Another great find! 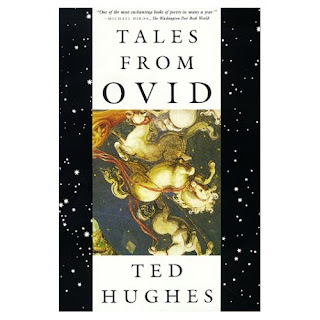 Ted Hughes' Ovid is simply wonderful. I recal reading it and agreeing with one of the reviews on the back that claimed Ted Hughes has returned the Gods back to their primal majesty. ...Or words to that effect.